Posted on 5 June 2008, in MacGDBp. No Comments. The bug with XML parsing I mentioned in the last post caused me days of grief. I’ve been trying to find the cause of that bug (off and on, albeit) for months. It turns out the fix was very simple. 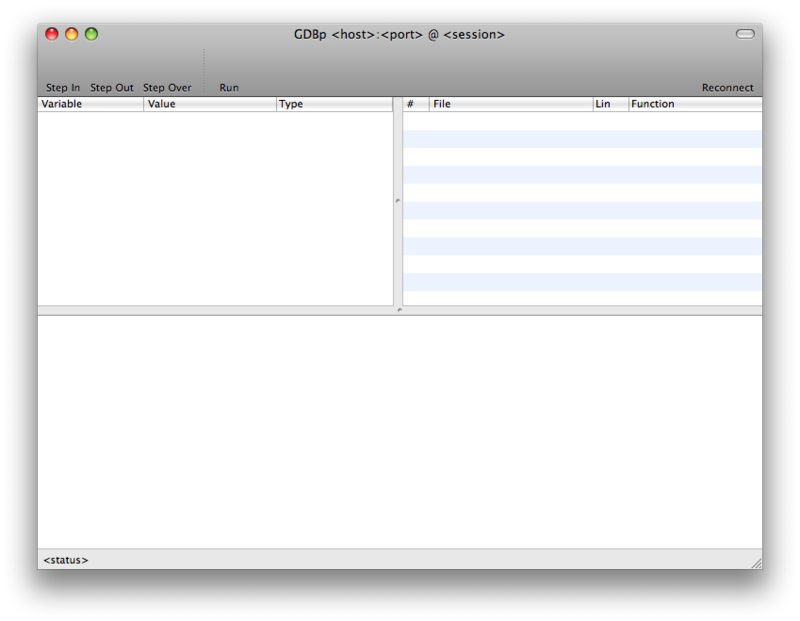 All that’s left is creating the breakpoint manager and then MacGDBp will be released. Hopefully by the end of next week v1.0 will be in your hands! In this post, I’m going to talk about icon design. One of the ideas I had for this was to use the PHP logo in some way — but using logos in an icon is tacky. Instead, I decided to keep the purple of the PHP logo. Since PHP is internet-based, I decided to take inspiration from the words “World Wide Web” and I drew out a globe. So at this point, I had a purple globe. Now I had to decide what to design on top of the globe (because a purple globe only conveys internet connectivity). For this I really saw two options: a screwdriver and wrench or a toolbox. On Mac OS X, the screwdriver-wrench combination usually implies configuration (c.f. Color Sync Utility, Raid Utility, configure toolbar item, etc.). Debugging is not in the same vein as configuring, so I ruled that one out. The toolbox, while unused on Mac OS X (except for the Adobe ExtendScript Toolkit), seemed like a good fit. I should also note that I thought about drawing a yellow spray can — akin to the debug icon in Xcode — but quickly dismissed it for being too similar to Xcode. Then I recreated the sketches digitally. You can see how the design evolved here. Hopefully the next post about MacGDBp will be the release announcement! Posted on 2 June 2008, in Uncategorized. 3 Comments. Inmy last pipeline update, I said that MacGDBp would be out by May. Unfortunately, I’ve run into two bugs that I’m not quite sure how to work around. One of them involves NSXMLDocument raising assert() messages for what appears to be valid XML. Weird, right? So instead, I’m going to write an article about MacGDBp in hopes of whetting your appetite for it until it’s done. The idea for MacGDBp has been in my head for a long time. PHP debuggers are far superior to var_dump() and print_f() debugging statements. Unfortunately, only the Zend IDE was available — but it cost money and was ugly (i.e., not Mac-esque). Next came Eclipse with the web tool kit. I had a heck of a time getting the debugger to work and ultimately gave up. Additionally, it too was ugly. So I put up with my combination of BBEdit (and later TextMate) and var_dump()/print_f(). Fast forward a few years to the introduction of the Xdebug extension. This extension is absolutely fantastic, if only for the stack traces in errors and uncaught exceptions. But it also has a remote debugging function. For about a month, I used the packaged command-line demonstration tool and read XML to glean debugging information. Then at the end of July/beginning of August 2007, I made the decision to write a native Mac application for the Xdebug remote debugger. It’s rare for me to design an application without first sketching out the interface on paper. But because this was such a straight forward project, I decided to wing it. The second commit in the git repository was “Laying out an unhooked basic interface for the system.” This was the first revision. Then I realized that I was trying to re-invent something that had already been well-designed. So with the next iteration, I mocked up Xcode’s debugging window. And there you have the final design. In the next couple of days I’ll talk about how I designed the icon in an effort to stall while I squash the last few bugs. MacGDBp will require 10.5. And this is not because I don’t want 10.4 support, but MacGDBp relies on a bug that was fixed in 10.5. In Mac OS X, there is a class called NSTreeController that I use for the variable list. But under 10.4, parts of this class were not properly exposed and were very buggy. I found a work-around, but it relied on using private, undocumented API calls. In 10.5, Apple fixed the bug and exposed the necessary parts.